Newly finished watch by Geoffrey Roth Watch Engineering Collection, with hand engraving by Todd Daniel. Made in Arizona. We here at A Timely Perspective are lovers of all things horological… be they well established manufactures that predate electricity to brand new independent houses. In short, if the creativity and vision are there, well, you have our attention. One such creative, albeit a relatively young brand, based out of Arizona has begun gathering attention thanks to its aesthetic goal of creating pieces that are “engineered sculpture” crafted in America. Geoffrey Roth Watch Engineering (ok, we admit, the name loses a lot on the translation) is all about hand-craftsmanship, exquisite engraving and detailing of cases and American artisans. These watches are not for everyone, but then, that’s what makes Geoffrey Roth Watch Engineering timepieces so special. 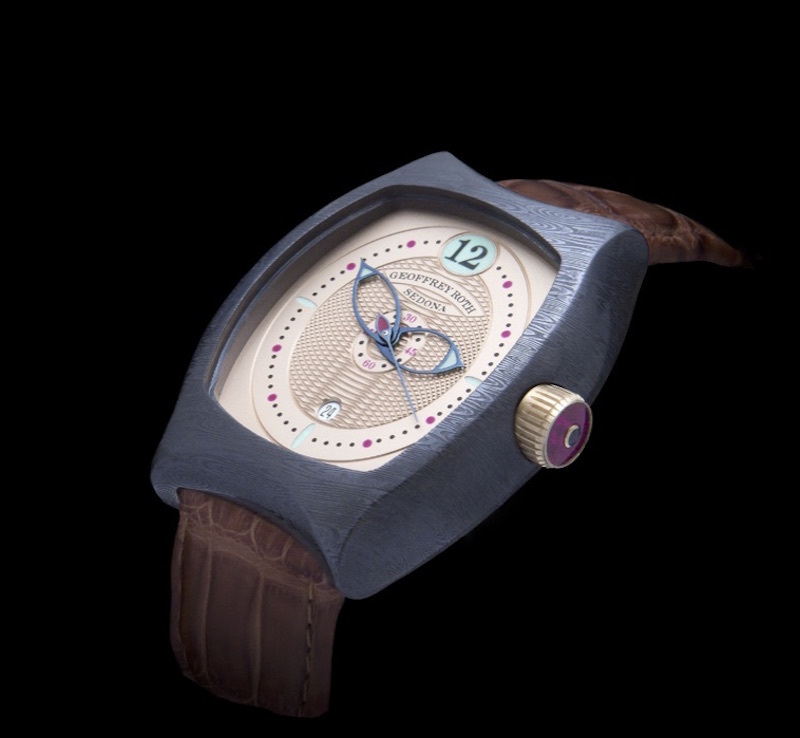 This Geoffrey Roth Watch Engineering Collection HH3 watch is a 36mm steel piece with SuperLuminova hands and markers. 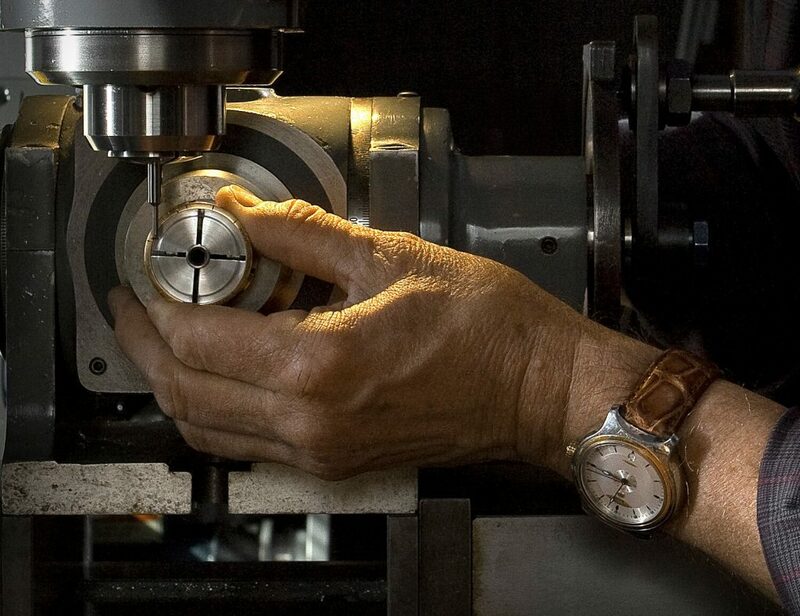 The American-made watch houses a Swiss ETA movement. Most Geoffrey Roth Watch Engineering timepieces retail in the $30,000 range and have specific detailing that will have everyone taking a second look. By combining workhorse Swiss-made ETA movements with vivid styling, Roth has forged an alluring blend of old-world horological expertise and American classic contemporary design, with a dash of Southwestern flare. In keeping with that ethos, Geoffrey Roth watches are accented with subtle nuances that drive the hand-crafted aesthetic. At first glance, the watches look round, however a closer inspection shows integrated lugs that reach out from the top and bottom of the round case and form architectural arches behind which the strap nestles and that give the watch a very regal appeal. 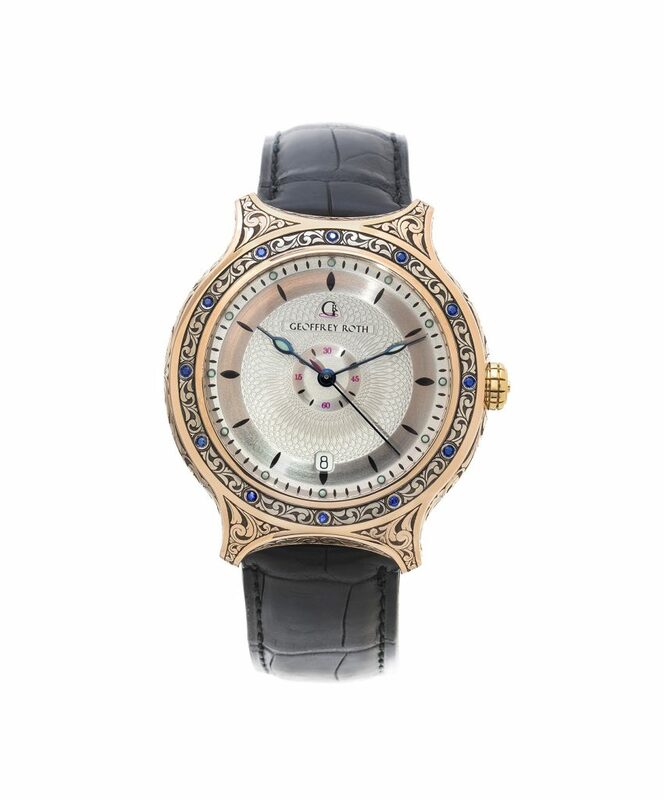 Geoffrey Roth Watch Engineering Collection HH5 Tonneau watch is a 43mm case with Damascus steel and domed sapphire crystal. The geometric beauty of these special case is matched by the stunning scroll work and embellishments on it, as well as on the dials. 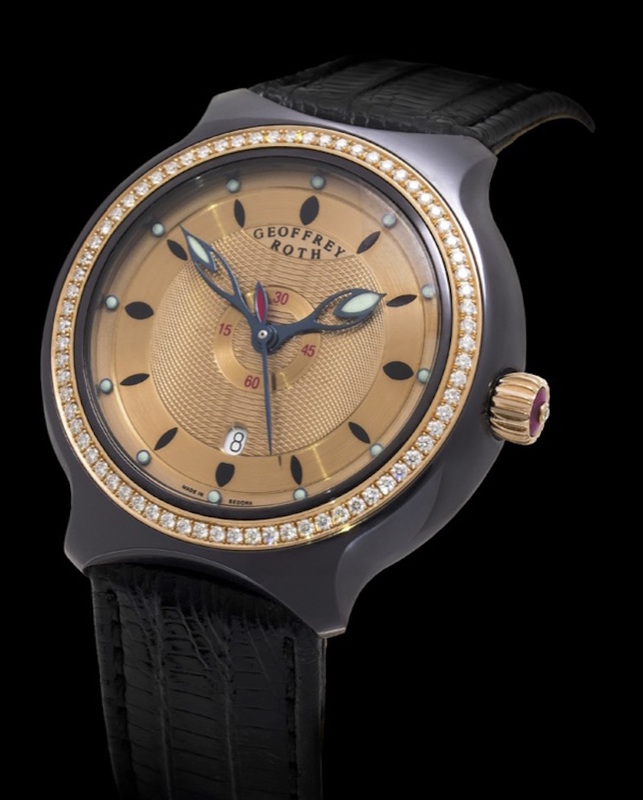 The Geoffrey Roth dials, which are either Argentinian sterling silver or 18-karat rose gold, are engraved one at a time, never die-struck, and are printed on in house proprietary machines built by Geoffrey Roth himself. Each dial features a stunning pattern resembling elliptical motifs, honeycomb like patterns and more. A signature of the brand is the sculpted crown, which is set with a a synthetic ruby and draws its inspiration from the jewels found in the movements of the antique pocket watches used by train conductors of yesteryear — watches that Roth was drawn to as a child. In fact, Roth’s career began in 1974 when he first opened a gallery showcasing high end jewelry. After twenty four years, his appreciation of fine jewelry led to a love of all things mechanical and to pure hand-crafted design. In 1988, he began the next phase of his career: becoming a self-taught engineer and watchmaker. His initial creation was the HH1 prototype, an entirely handmade piece that took more than two years to complete, and was constructed entirely from a solid piece of brass. This first project enabled Ross to achieve the flowing lines, curvature and texture he wanted in the finished product. Geoffrey Roth of Geoffrey Roth Watch Engineering Collection out of Arizona. Today Roth offers five different iterations (including tonneau-shaped cases) in the Geoffrey Roth Watch Engineering Collection, the HH2, HH3, HH4, HH5 and the HHS/D Diver, with a patent pending silent bezel. 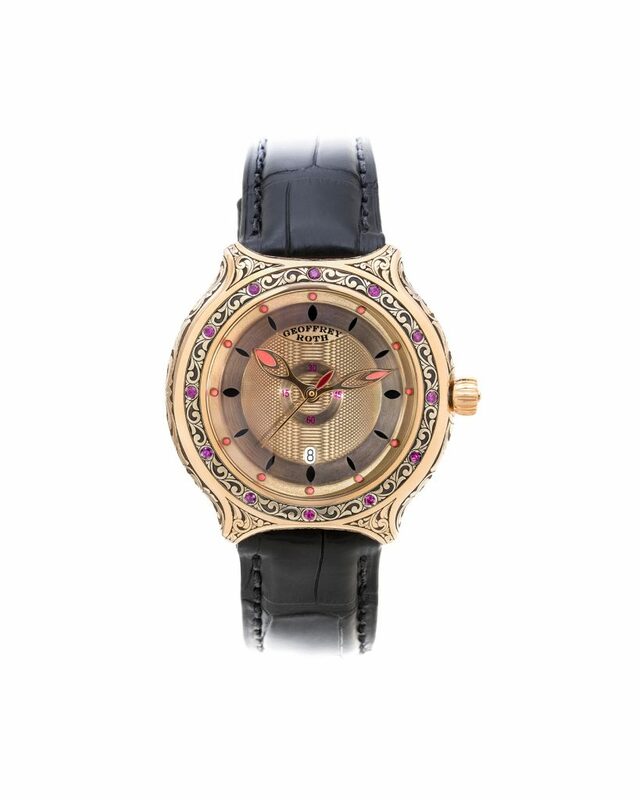 Each model comes in a variety of metal choices ranging from stainless to Damascus steel and 18-karat gold. The line ranges in size from 36mm to 43mm. The HH2, HH3 and HH4 sport the aforementioned round case design with arched lugs, feature hacking second hands, a quick-set date feature (with aperture at 6:00) and offer 42 hours of power reserve. The HH5 is a tonneau case, and also features hacking seconds with a quick set date at the 6 o’clock position. The Geoffrey Roth Watch Engineering Collection watches are made in Sedona and Scottsdale, AZ, with hand crafted attention to every detail. The HHS/D diver watch comes in either stainless steel or marine bronze. It offers a patent-pending unidirectional silent bezel with a ceramic polymer inlay for hours and minutes. It is water resistant to 100 ATM, but has been lab tested to depths of 270 ATM with no compromises to structural integrity. Each Geoffrey Roth Watch Engineering timepiece is hand crafted and hand finished in Sedona and Scottsdale, Arizona, and are powered by one of two ETA movements. The ETA caliber 2892A2 has been outfitted with an in-house tungsten rotor and powers almost all models. The HH3 e is powered by the ETA 204.911 Autoquartz caliber. All straps are American-made, hand-stitched, farm-raised Louisiana alligator with a double-deployment stainless-steel clasp. Dial patterns and motifs on the Geoffrey Roth Watch Engineering collection timepieces are made by hand. 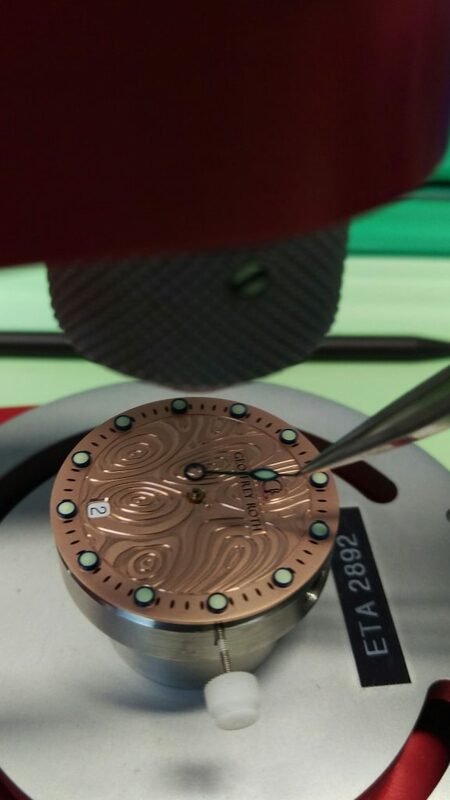 The meticulous engraving on certain of the Geoffrey Roth Watch Engineering collection watches is done by local Arizona artisan, Todd Daniels. Todd Daniels’s thorough knowledge of metallurgy, coupled with his long professional hand-engraving experience, enable him to engrave in a remarkably wide array of styles. His scrollwork, portraits, monograms and script have earned him an international reputation as an artist and master hand-engraver. A professional goldsmith and jeweler for three decades, he produces pieces for clients via his company, Prestige Designs. 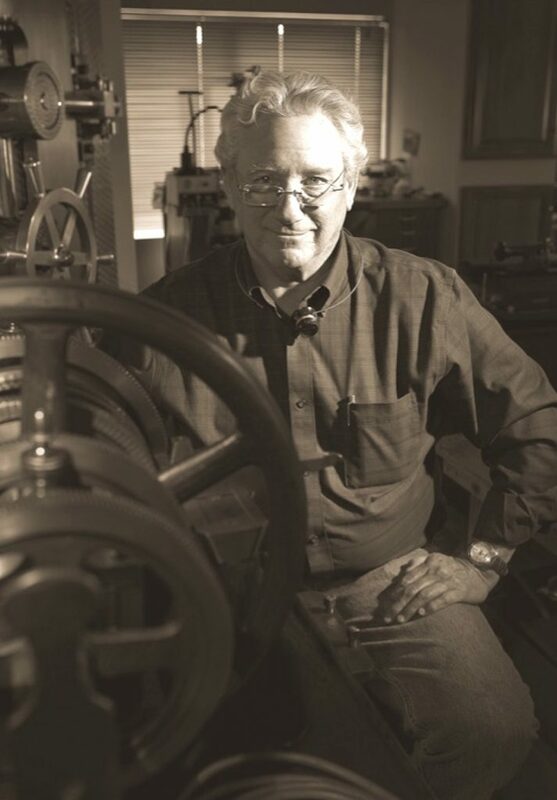 Geoffrey Roth’s early work moved Daniels to such a degree that he was compelled to call the watchmaker, unprompted, and suggest a collaboration. Roth describes their first encounter as “fate,” explaining that hand-engraving has always been a special skill for which he has great respect. Great as well is his respect for Daniels, whom he describes as one of the finest engravers he has ever met. In 2017 Geoffrey Roth was invited to exhibit his watches with Todd Daniels engraving at the annual Smithsonian Craft Show. Th HH4 round watch by Geoffrey Roth Watch Engineering Collection is the largest size at 46mm. 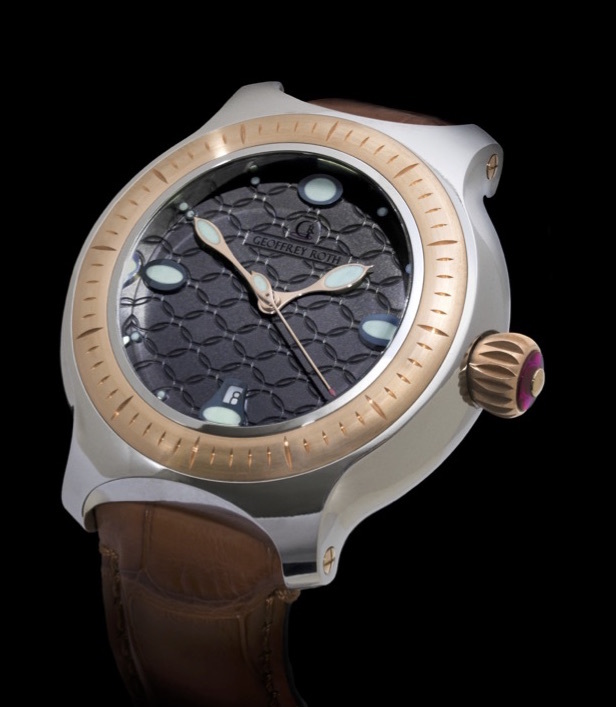 This version has an optional AlTiN coating and inlaid bezel in phosphor bronze. If you are looking for a unique American watch, look no further. Geoffrey Roth offers a very special narrative in the watchmaking world, and is a brand we look forward to seeing grow and develop.